The Sahara Desert is a magical and captivating place, and one of the many flames of fascination with Morocco. Morocco Desert tour is a must for novice and experience travelers who still has not discover one of the world’s natural wonders. If you are one of those travelers, who decided to see firsthand the indescribable beauty of the Sahara Desert, Morocco Shiny Days will help you plan an unforgettable journey. The Sahara Desert is the largest desert in the world, it lies within the borders of eleven states, but Morocco is one of the handful of countries where you can still visit Sahara without problems. colorful photos of the harsh beauty of the greatest desert of the world are promised! a panorama of the starry sky and the shining band of the Milky Way during an overnight stay in the desert. Sand areas of the Sahara are called Ergs, and they are only 25% of the total area of the desert. There are two major Ergs in the Moroccan Sahara: Erg Chigaga and Erg Chebbi. You can make the trips either from Marrakech or from Fes; both are picturesque journeys with many interesting points of interest along the way. Erg Chebbi is relatively easy to reach from both Fes and Marrakesh. 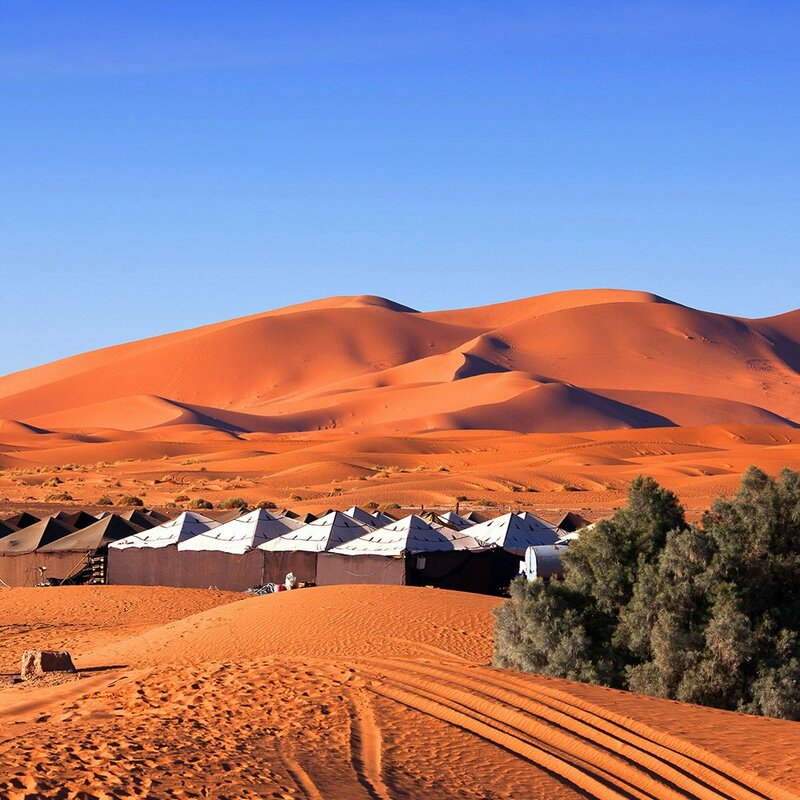 Our very popular desert tour starts in the town of Merzouga, east of M’Hamid. It contains a well-developed tourist infrastructure, is less remote, and has a more touristy feel. But it is here you have a chance to see a really brilliant collection of eternal dunes, the largest dunes in Morocco (up to 150m high). Erg Chigaga, on the other hand, is harder to reach. It is the largest and widest desert in Morocco with dunes around 60m high. It is less developed, less touristy, and offers an unspoiled charm. Out desert tours begin in the village M’Hamid, from where you will be taken along the picturesque 40-kilometer route to the heart of the Moroccan Sahara – Erg Chigaga. One must travel from Marrakech to M’Hamid where the road ends, then continue via 4×4 all-terrain vehicle. Your exact desert destination and the length of your stay is a choice based on your personal preferences. Our team will be happy to work with you and advise you on the best option for your Morocco Desert Tour – the trip of a life time.